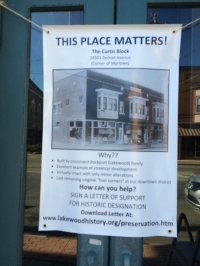 As a result of this effort, 207 people enthusiastically signed a letter in support of the historic designation of the Curtis Block building. THANK YOU LAKEWOOD for your overwhelming support! The Curtis Block has a direct historical connection to the early settlement of Lakewood and one of its founding families, the Hall family. Designed and built by Charles Pennington, the building is a wonderful example of our street-car era development. As part of the only remaining original "four corners" in our downtown district, this gem is just begging for a fabulous make-over. The Lakewood Historical Society Preservation Committee is continuing to raise awareness with regard to this fine building which has graced this corner for the past 103 years. It is currently threatened by the proposed hospital closure and potential re-development of the block. You can help preserve Lakewood's history. 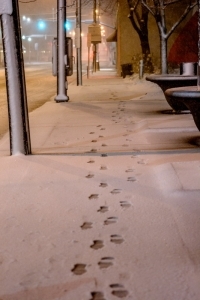 Call the Planning and Development Office at (216) 529-6630 and voice your support for saving our history. 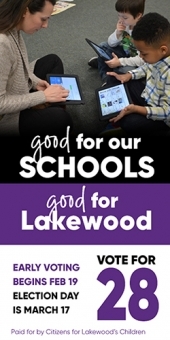 Or go to lakewoodhistory.org, click on the “preservation” tab and then “sign a letter of support” tab to print and send your own letter. After all, a city without its old buildings is like a man without his memory. THIS PLACE MATTERS!